I may have mentioned this before, but I am not a fan of cleaning. That doesn't mean I don't like a clean house, because I most certainly do. I just don't particularly care to clean my own house when I could be reading a great book instead. For years, I had a fabulous young woman that helped me keep my house clean. When I started working from home, and freelancing, we decided that having her come to clean, wasn't a necessary item in our household budget, and I took on the main house cleaning role again. Being the organized person that I am, I decided on a daily cleaning schedule, much like my grandmother did when I was a little girl. On Monday, I clean the bathrooms, Tuesdays is dusting day, and so on. Every day includes tidying up and laundry. By sticking to this routine, my house is usually neat and relatively clean, should you drop by. In the spring, I get a little more enthusiastic about clearing out the junk, cleaning the place up and brightening up everything. And I love the way a house smells when it's clean. Recently, through my essential oil journey, I found the most wonderful, non-toxic multi-purpose cleaner. I had read countless testimonies about how wonderful it was and how people used it to clean just about everything. . .from fabric to granite. This amazing multi-purpose cleaner is the Thieves Cleaner available from Young Living. It's sold in a concentrated form, and you you can make your own spray bottles of cleaner in the strength best suited to your cleaning needs. It's very economical, as a cap full of concentrate, mixed with three cups of water, goes a long way. I feel so good about using this cleaner on my counter tops and where my kids and cat hang out. No harsh smells to irritate us, or lingering chemicals on our surfaces. And it cleans GREAT! I don't notice any difference between this and my old, chemical-filled harsh cleaners. 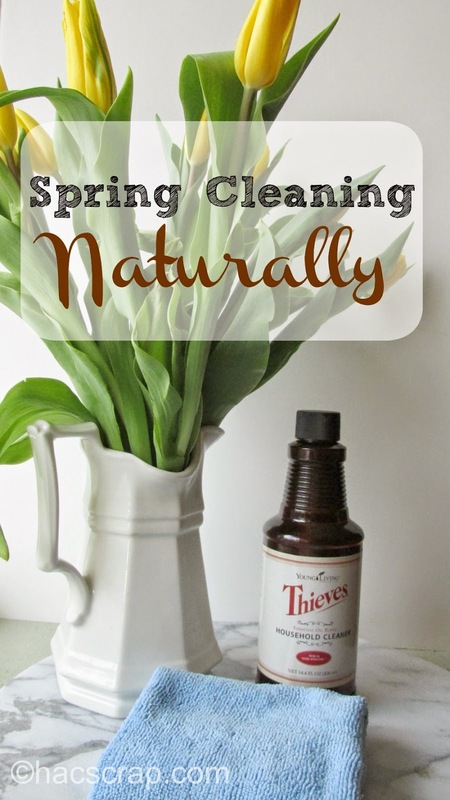 In fact, there are all sort of natural cleaning recipes from Young Living you can use this spring! Another way you can "clean up" your cleaning game, is by using reusable cloths (such as microfiber or old t shirts) to save on paper towel waste, By making your own cleaning supplies, you can re-use your spray bottles and containers, cutting down on the amount of plastic bottles that are discarded too. Those are two more wins for the environment and our planet! What's your favorite natural cleaning method or product? You can contact me for more information on essential oils, Young Living, or how you can earn free oils and Young Living products. I'll definitely try this out. I stick to vinegar and water and/or baby wipes for the kitchen and around the house while my husband uses the heavy duty stuff in the bathrooms. I do need something natural for our wood floors so this would be great. I've always heard of Thieves, but never tried it. Will now! Thanks! It's an amazing product line Cindy! If I can help, just let me know. Orange essential oil is the sweetest smelling of the oils I keep on hand. It’s one of the cheapest essential oils too. I like to use it as an alternate when I’m feeling like I want a change from the usual lemon and lavender. Love, love, love me some Thieves!